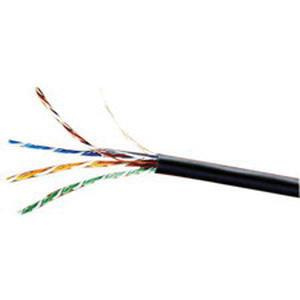 West Penn Wire 24/4P Plenum rated CMP category 5e cable has voltage rating of 300-Volts. Cable features green rugged jacket and fluoropolymer insulation to provide resistance against moisture, heat and sunlight. Bare copper cable offers capacitance of 14 pF/ft between conductors and resistance of 26-Ohm/1000-ft. This 0.205-Inch OD cable has UTP shielding to protect the signal from external interference. Cable has blue, white-blue orange, white-orange, green, white-green, brown and white-brown color-coded insulations for easy identification. It has operating temperature range of -20 to 75 deg C. It is perfect for use in 10/100 Base-T Ethernet, IP CCTV and digital integration. Cat 5e cable meets ANSI/TIA-568-C.2 standards.